Adelaide Hashimoto & Hypothyroid disease is becoming an increasingly problematic condition within the population. Women are 7 times more likely than men to develop a thyroid disorder, however, both genders have similar symptoms. Hypothyroidism is one of the most common thyroid disorders in Australia. One recent analysis suggested that up to one in 10 women has clinical or subclinical hypothyroidism. Adelaide Hypothyroid sufferers are characterised by mental slowing, depression, dementia, weight gain, constipation, dry skin, hair loss, cold intolerance, hoarse voice, irregular menstruation, infertility, muscle stiffness and pain, and a wide range of other unpleasant symptoms. Men can also experience erectile dysfunction if the thyroid disorder is not well managed. So what's the difference between Hashimotos and Hypothyroidism? A low functioning thyroid is called Hypothyroidism. This can occur from nutritional deficiencies or from an autoimmune reaction. People who have hypothyroidism due to an autoimmune condition are said to have Hashimoto's Hypothyroidism. Autoimmune simply means that the bodies immune system is attacking its own tissue, the thyroid in this case. If you experience any of the symptoms above, you may have a thyroid condition and should be screened by an Adelaide Hypothyroid Specialist. So why is this condition so common yet underdiagnosed? Adelaide Hypothyroid & Hashimotos disease is severely underdiagnosed due to the standard tests performed by the mainstream medical community. Medicare dictates what tests can be performed by GP's and any out of pocket tests are simply not offered to patients. If GP's were allowed to run any tests they wanted, Medicare could go broke and break the Australian public health system. For this reason, many very important test are not performed. If you suspect that you have Hashimoto's or Hypothyroid issues the GP will run a standard TSH (Thyroid Stimulation Hormone) test. Only if this test comes back abnormal will the doctor run a full thyroid panel. This is a huge problem, as TSH is not a good indicator of underlying thyroid problems. TSH will only come back abnormal when something is severely wrong and often past the point of repair. AF Health runs a full thyroid panel on all patients with a suspected Thyroid disorder. This gives a clear indication of what's happening with the thyroid and what to do about it. Take a look at the test result below. 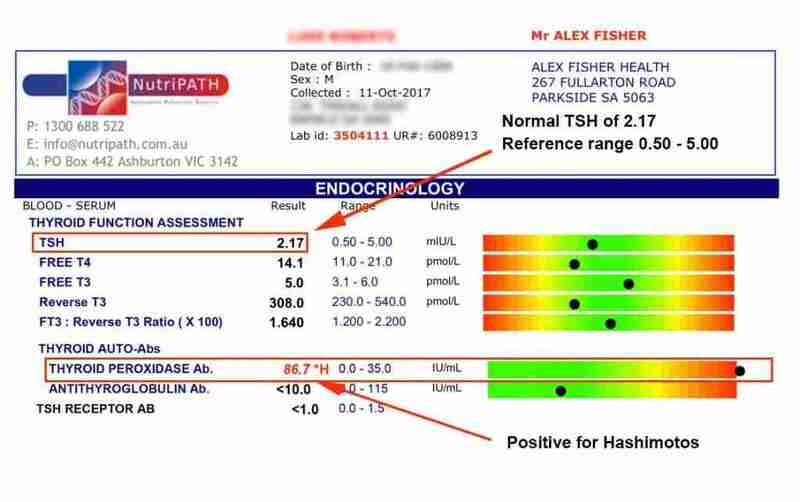 This patients clearly has a normal TSH range but high antibodies which means this client has Hashimoto Hypothyroidism. If a standard TSH test was performed this would have been missed. Not until the thyroid was destroyed would the TSH have shown abnormalities, by this time it's often too late to fix. Before treatment can begin, a full thyroid panel must be completed. This will give Alex all the information he needs to treat and manage your condition. The test results will show if your thyroid condition is a result of nutritional deficiencies or an immune reaction (Hashimoto's). If your results show immune-mediated thyroid issues (Hashimoto's) then a more comprehensive treatment plan is needed. This involves removing immunogenic foods, using immune modulating herbs and correcting any other underlying conditions. Addressing the immune imbalance is critical to stopping further destruction of thyroid tissue, and in cases where Hashimoto’s is caught early enough, it may prevent hypothyroidism from developing in the first place. If you have been diagnosed or suspect a thyroid disorder, make an appointment today and get your individualised treatment plan underway.